What Are The Rules to Pai Gow Poker? - Casino Answers! 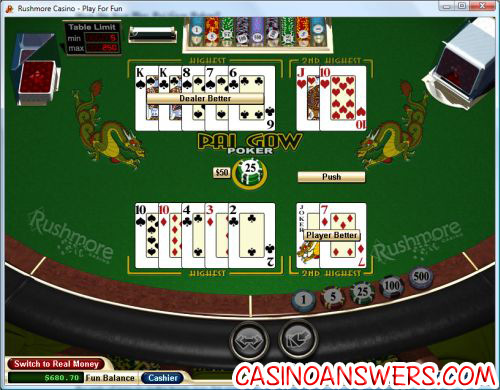 Casino Answers » Pai Gow Poker » What Are The Rules to Pai Gow Poker? What Are The Rules to Pai Gow Poker? If you’ve never played Pai Gow Poker before, then either during reading this article or by the end of it, visit Slotastic Casino and try out their Pai Gow Poker practise tables. It will really help with fully understanding the wonderful game of Pai Gow Poker. Okay so the first thing you need to know about Pai Gow Poker is the objective of it: it’s to beat the dealer. When you go to play Pai Gow Poker, you will have to put down one singular bet. After doing that, the dealer will deal out 7 cards to you, and 7 cards to all other players at the table. The dealer will then deal 7 cards to themselves. Now that you have these 7 cards, you have to split them into two separate hands. These are generally known as a “High Hand” and “Low Hand” although that’s actually quite confusing – it’s more a case of “High Hand” and “Second Highest Hand”. Okay so in that hand we have a pair of tens, 4 rags and a joker card. What you need to know about the joker card is this – it can only be used to complete a flush or straight, or as an ace. So in this particular card it cannot be used to complete a flush or straight, so its only use is as an ace. What we need to do is split these cards into two hands. One hand must contain 5 cards and is our highest hand, and the other hand will contain two cards, and is our lowest hand. The most important thing to remember is that the highest hand MUST be higher than the second highest hand. We cannot put the pair of 10s in the second highest hand for example: they MUST be in the highest hand. Based on this, we would put the pair of 10s, and the 4,3,2 in the highest hand. We would then put the joker, using it as an ace, in the second hand along with the 7. This gives us ace-high in the second hand with a 7-kicker. Once this is done, the dealer turns over their hands. Our highest hand goes head to head with his highest hand, and our 2nd highest hand goes head to head with his 2nd highest hand. To win the game, we must win both hands. If we win one hand but lose the other it is considered a push and we get our bet back. If we lose both hands then we lose the bet. As you can see, our pair of tens lost to the dealers pair of kings. However in the other hand our ace high beat his jack high, so we win that hand and it is considered a push. And that’s all there really is to Pai Gow Poker. Simple, huh? Now take advantage of this great Pai Gow Poker Bonus and hit up the Pai Gow Poker tables at Slotastic Casino. What’s the deal with dice in Pai Gow Poker? 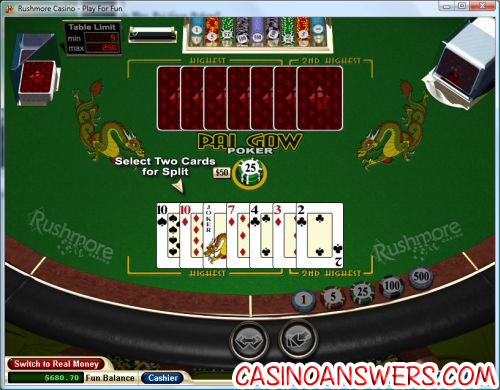 If you are playing a multiplayer game of Pai Gow Poker in a live casino, then dice are utilized. These are used only to determine the order of play. The dealer will shake a container of three dice, and each players position is assigned from one to seven. This includes the dealers position. When the total on the thrown dice exceeds seven, you subtract seven from the total and the difference of these will indicate who will be dealt first. It’s basically just as random as dealing out a card to everyone and having the high card go first, but spices up the game a bit. How do you play Pai Gow Poker? Pai Gow Poker Rules? Pai Gow Poker for Dummies?